Our primary goal in developing the Great South Bay (GSB) lower trophic model is to describe the structure of the bay in a mathematical framework that will facilitate evaluation of clam restoration plans in order to identify the most cost effective route to restoration. Under this modeling framework, the effectiveness of proposed restoration plans can be evaluated quantitatively and will provide managers, scientists, and stakeholders with opportunities for constructive discussion to develop the best restoration approaches. For instance, with a validated ecosystem model we will be able to address whether clam populations will rebound if we reduce nutrient inputs to the bay as well as identify the optimal locations for planting of mature clams. The first task in developing a lower trophic model of GSB was to identify the most important species and abiotic forcing factors in the system. 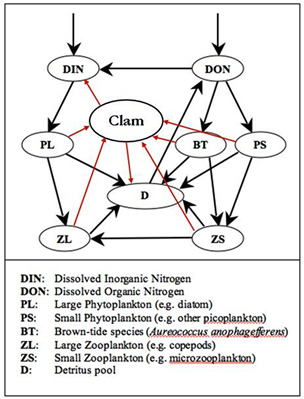 With the help of accumulating empirical evidence, we identified five main compartments in the model: nitrogen, phytoplankton, zooplankton, clams, and detritus (D). Several of these main compartments were further subdivided to represent different types or size classes. Specifically, nutrients were divided into inorganic (DIN) and organic (DON) forms. The phytoplankton compartment was subdivided into small (PS) and large (PL) phytoplankton. We also set up a compartment for brown tide (BT), since this harmful alga is critically important to the functioning of the ecosystem. Phytoplankton compartments were assumed to have different physiological characteristics (e.g., nutrient uptake rate and acclimation to light intensity). The zooplankton compartment was subdivided into small (ZS) and large (ZL) zooplankton. Each of these zooplankton groups was assumed to have different feeding preferences on phytoplankton and each other.